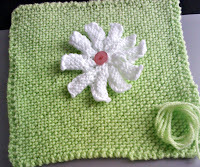 A simple garter stitch square made to look different by adding a flower. This is for my April swap partner in the Knitting Paradise forum. I hope she will like it. The flower was really easy and adapted from a Daisy pattern I have. Row 3: Bind off 5 sts Purl wise, P2, turn, with yarn in back slip fist stitch purl wise, bring yarn to front, P2. You will have 4 sts on needle. Row 6: KFB in first stitch, slip these two stitches onto left-hand needle, cast 0n 4 stitches by cable method, P all nine stitches. Repeat from Row 2: to Row 6 a total of 8 times more then work 2nd and 3rd rows again. 10 petals in all. Bind off..
Sew the petals to form a circle. With a long length of yarn sew a running stitch around the circle and draw up tight and fasten off. Add a button to the centre. 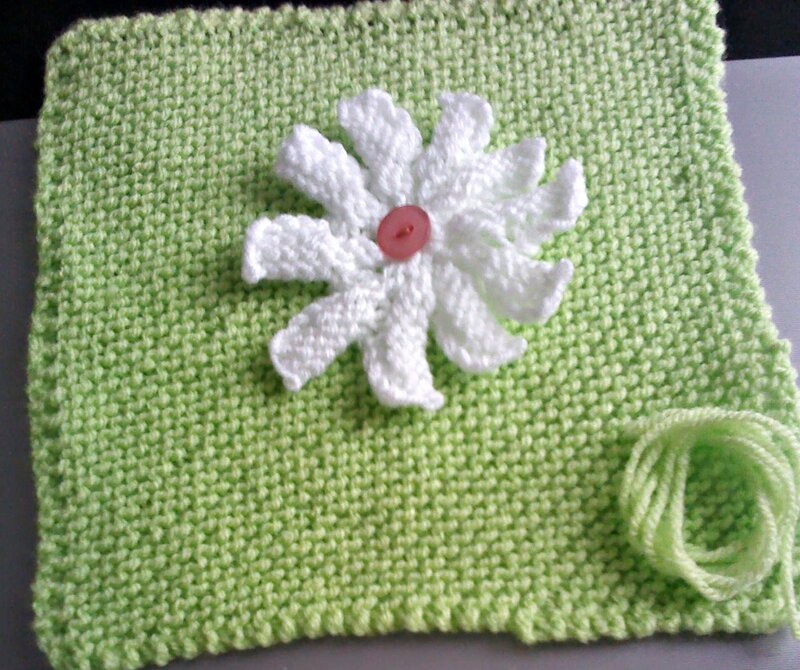 I sewed the flower to the square by sewing the button through the flower and square at the same time. You can add a second set of petals in a different colour if you like, but I like the simple single petal flower for the squares as it is less bulky.